Refactoring is a controlled technique for improving the design of an existing code base. Its essence is applying a series of small behavior-preserving transformations, each of which “too small to be worth doing“. However the cumulative effect of each of these transformations is quite significant. By doing them in small steps you reduce the risk of introducing errors. You also avoid having the system broken while you are carrying out the restructuring – which allows you to gradually refactor a system over an extended period of time. What we’re going to do is to extract them out in to a separate method. To do so, we first highlight the lines to extract, then click “Refactor -> Extract -> Method”. This will display the “Extract Method” dialog, which you can see below, pre-filled with a default set of options. This way, the function is that much clearer, and the generated PhpDoc block will contain that information as well. Clicking “Refactor” both generates the new method, and replaces the highlighted code, with a call to it, which you can see below. This refactor operates in quite a similar way, but we’re going to access it differently. 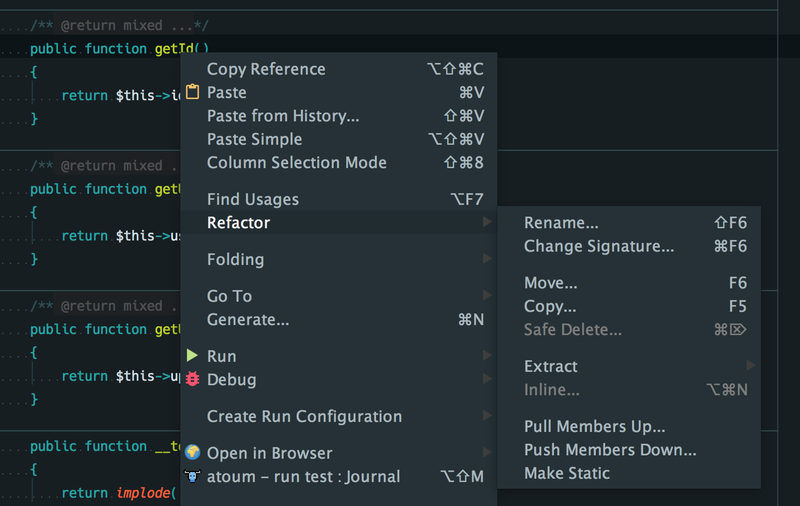 This time, we’re going to use the context-menu instead of the main “Refactor” menu. To do that, as in the screenshot below, either right-click, if you’re on Windows or Linux, or do a two-finger click if you’re on a Mac. From there, go to “Refactor -> Rename”, which will open a small popup, where the name is highlighted, which you can see below. From here, change the name to something more suitable; in this case, I’ll change it to getJournalId. If you want more options, then click Shift+f6 (check your keyboard mappings) which opens up the “Rename” dialog, which you can see below. 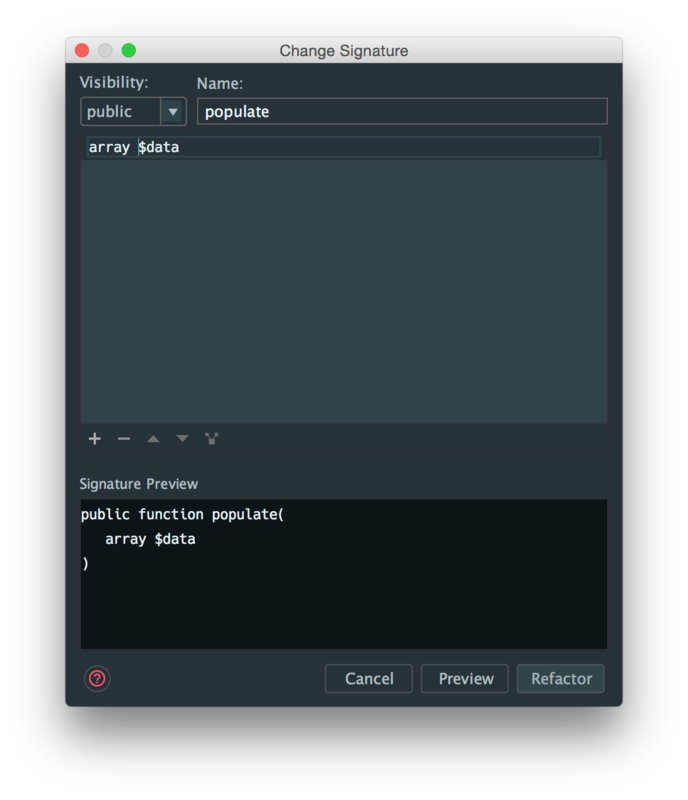 This let’s you be more specific in how the rename will happen, as you have the ability to have PhpStorm search in both comments and strings, as well as for text occurences. When you click “Refactor”, PhpStorm will search for all occurences of the function, whether the definition or calls to it and display a preview window, displaying all the occurrences which it’s found. At this point, stop for a moment. Don’t automatically click “Do Refactor”. 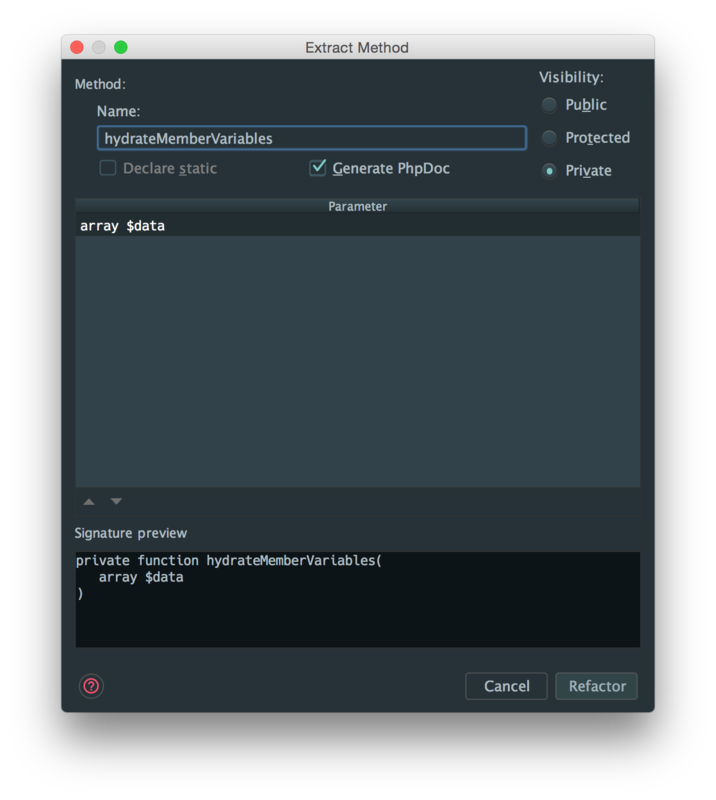 The reason why is that depending on the method name which you’ve chosen, PhpStorm might have found occurrences of it which don’t relate to your implementation, but one in another vendor’s library. If that’s the case, right or two-finger click the one that’s not relevant, and click Exclude. With that done, click “Do Refactor” to complete the function rename. By clicking on $data I can then add in array to type-hint that $data is an array. Clicking enter confirms the change, as well as updates the “Signature Preview” window. As with renaming a function, we can either preview the change or complete the refactor.